You might just be getting used to the idea of electric cars, but now hydrogen fuel celled cars are also making a play for some of the limelight. 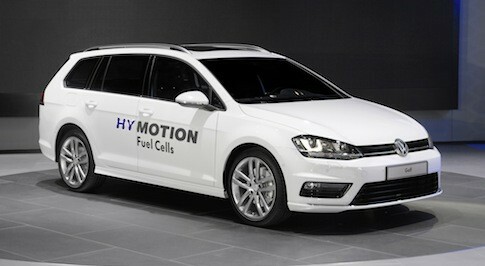 Volkswagen is the latest manufacturer to throw its hat into the hydrogen ring, with its Golf SportWagen HyMotion. Similar to its battery-powered e-Golf, this new model looks nearly identical to a regular petrol or diesel Golf but has much better green credentials. First displayed at the LA Auto Show earlier this year, it's currently just a research project. However, it does suggest their could be a hydrogen-powered in the Volkswagen lineup eventually. But you're probably wondering how do cars powered by hydrogen fuel cells actually work? Well, Volkswagen are working to solve that problem too, with the video you can watch below. Put simply, the hydrogen is combined with air from the atmosphere in the fuel cell, which creates electricity that powers the car. The full answer is rather more complicated, so why not click the video below and let Volkswagen explain.